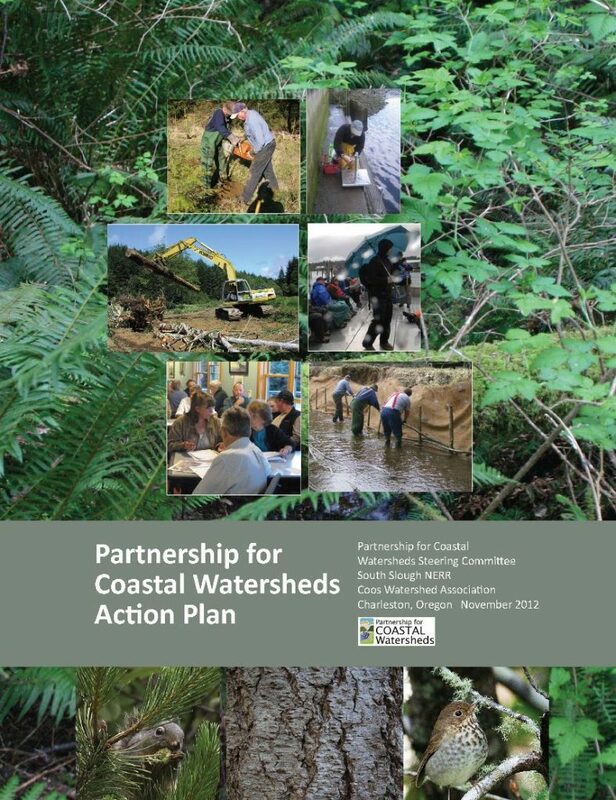 The Partnership for Coastal Watersheds (PCW) Action Plan is a document developed by the Partnership Steering Committee that identifies and prioritizes a set of “actions” that, when implemented, will help the community obtain its vision for the future. Through a series of facilitated meetings convened in 2011 and 2012, the Partnership for Coastal Watersheds Steering Committee created a Community Vision for desired conditions in the project area in the next 20-25 years, and with the use of project area status information in the State of South Slough and Coastal Frontal Watersheds assessment, generated and prioritized a suite of potential actions intended to assist in achieving that vision. The recommendations outlined in this Action Plan, downloadable as a PDF above, resulted in 37 priority actions that are intended to improve conditions in the project area. The Partnership Steering Committee based its work on the “triple-bottom line” philosophy of sustainability that explicitly considers community, economy, and environment effects in determining how to proceed with future planning and development, an approach embodied in Partnership for Coastal Watersheds’ mission and vision. The triple-bottom line philosophy is also evident in the broad array of projects that are considered as priorities for implementation. The PCW has begun implementing the highest priority actions identified in the Action Plan through its more recent projects: Communities, Lands, & Waterways Data Source, Water Quality Monitoring Network, Hydrodynamic Model, and the Coos Estuary Land Use Analysis. o	Keep active a future planning and issue discussion forum like the PCW Steering Committee to cooperate on projects and focus on common ground. o	Advise county on Comprehensive Plan with regards to shoreline infrastructure, estuary (CBEMP) and wetlands management. o	Develop climate change scenarios, level of certainty and vulnerability assessments. o	Address “gaps” in freshwater quality data for TMDLs. o	Incorporate climate change effects into habitat restoration and management plans. o	Investigate the potential for the shipping channel deepening and widening to affect shellfish and other economically viable species, and evaluate change in flow characteristics in estuary using hydrodynamic modeling.